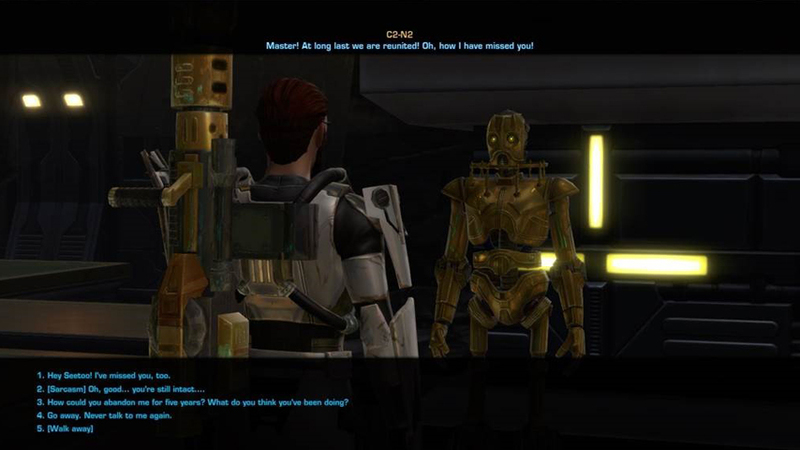 Be it the cheeky Astromech Droid, or any of the other 40-odd Companion characters found in Star Wars™: The Old Republic™ to-date; we all know and love our Companions (especially the chronically under-appreciated ship droids!). Companion characters have always been a big part of our personal stories, and with the upcoming release of the new Digital Expansion, Knights of the Fallen Empire, comes an even deeper focus on characters and storytelling. For this reason it only makes sense that we would seek to include our beloved friends (especially the ship droids!!) in that experience. Knights of the Fallen Empire has given us an excellent opportunity to take stock of the role of Companions within Star Wars: The Old Republic (from both a gameplay and storytelling standpoint), and to enhance their behavior and mechanics, which have remained largely unchanged since the original launch of the game. I'd therefore like to take some time to share with you some details about the changes and new features related to Companions that will be coming with the launch of Game Update 4.0, as well as some of our thoughts behind these changes. Before we dive into the details, allow me to go just a bit into the "why", to provide some context for the reasoning that was guiding many of the choices we made. Here's a familiar scenario: Over the course of your adventures, you meet a new Companion character. They seem like an interesting, fun, or cool character, and you might like to run around the galaxy with them for a bit... but it turns out that their abilities just aren't a good match for your combat style... so you never use them. Ever. One of our biggest design goals is to try and eliminate as much as possible the artificial barriers that prevent you from playing with the Companions you want, when you want, and how you want. Another familiar scenario: You're presented with a story choice in a conversation. You know in your mind how your character wants to answer... but the Companion you've got with you will hate that answer, and you don't want to lose Affection with them, so you instead pick the answer that the Companion wants to hear. As much as possible, we want you to be able to participate in the story and make the decisions that you feel are true to your character. Simply put, we need to make sure the Companion system has both the versatility, and expandability necessary to keep up with your desires to have bolder, more meaningful choice options, as well as to fully utilize the incredible storytelling potential of Knights of the Fallen Empire’s episodic narrative. With the release of Game Update 4.0, all Companion characters will now be able to switch between all three primary combat roles. When summoned, a Companion's portrait will display an icon signifying their current combat role. The combat role can be changed at any time (provided you are not currently in combat) by right clicking on their portrait, and selecting a new role. When a Companion's combat role is changed, their ability bar will fully swap out for their updated role's abilities. This change is huge in terms of addressing our first goal of removing Companion usage barriers. Are you a Jedi Consular who dreams of nothing but galactic adventures with Qyzen Fess, only to be foiled by the fact that you want a healer Companion? Your longing has come to an end! Beyond lowering barriers, though, this change is also extremely important for the storytelling purposes of our third goal. Now that any Companion can fill any role, we will no longer have situations where we can't allow "serious consequences" to befall certain Companions, just because it might leave a player with no other Companion that can fill a given role. This was one of the tougher decisions we had to make, and while we anticipate it being one of the more controversial, we're still confident that this is the right call to make based on comments from players. The simple reality is that, more often than not, the need to gear Companions has wound up being more of a cumbersome hindrance -- not to mention a significant barrier to Companion use -- than a source of meaningful or satisfying Companionship and progression. The recent 12xp experience promotion and the Epic Story Boost have only brought this issue into sharper relief. Therefore, with the release of Game Update 4.0 in October, Companions will no longer gain combat stats from their gear; Companion gear will become purely aesthetic. This change also means that players can now freely use non-modable gear pieces to dress Companions, without having to worry about subpar stats! This separates style and function giving you the maximum in options for how you dress your Companions. As far as Companion combat performance goes, all Companions will now have baseline combat stats that automatically scale with your character level. This means that no matter which Companion you summon, no matter how long it has been since you last summoned them, they will always be able to at least perform at an adequate baseline level. Note: Even though Companions don't gain stats from gear, there are still ways to develop their power: This is now accomplished by building Influence, which we will get to shortly. 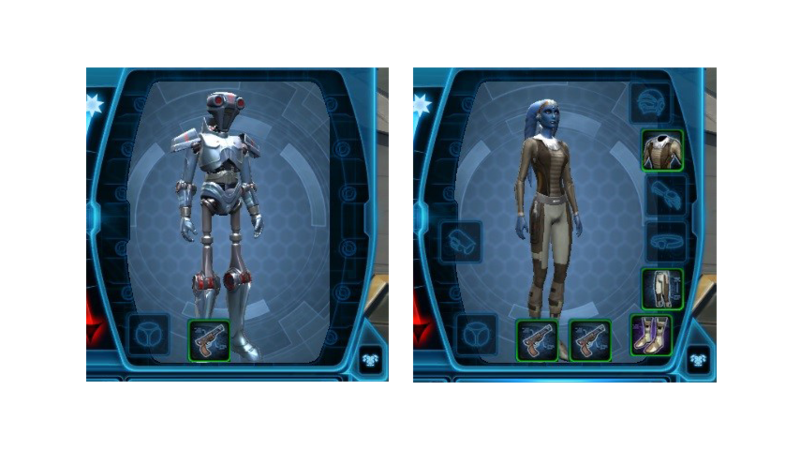 First, on the left, we have the lovable ship droid Companion 2V-R8. As a droid, none of 2V-R8's gear aside from his weapon ever changed his appearance, thus he only retains his weapon slot and his Customization slot (which all Companions will retain). Second, on the right, we have Vette. Vette is an example of the most visually customizable class of Companion: one that visually expresses every equipped armor slot. Vette retains all seven armor slots, and also has two weapon slots as a two-weapon fighter. You will notice that even Vette no longer has slots for an earpiece or implants, as these items have never altered the visuals of any character. With Game Update 4.0, Companions will no longer have "Affection", they will instead have "Influence". The Affection that a player has gained with each of their Companions will be converted directly into Influence at a 1:1 ratio when the change happens. Whereas Affection is a measure of how much a given Companion likes you (and thus it goes up and down as you make decisions that the Companion does and does not like), think of Influence as more of a measure of the total impact that you've had upon a person. When you make decisions with a Companion, whether that Companion likes or dislikes the decision you've made, you will still build Influence with them (as your decision still has a narrative story Influence over them in some way). Note that just because Influence goes up, it does not mean that the character necessarily likes you more, or that they don't disagree with your decisions. A character with which you have an incredibly high Influence score may still despise you, make it known in conversation, and then act upon their dislike of you when the opportunity arises. The base value of all gifts has been increased by 33%. Blue (Prototype) gifts have had their value increased by an additional 20%. Now Blue (Prototype) gifts are exactly twice as effective as Green (Premium) gifts, and half as effective as Artifact (Purple) gifts. Gifts of a given rank last much longer before their values start degrading, and they now degrade more slowly when they do start to degrade. Basically, gifts will give more than they used to, you'll be able to use gifts of a given rank longer than you could before. In a way, Influence kind of functions like "relationship XP" with your Companion. As you build Influence with a Companion, your Influence rank will increase. Every time a Companion's Influence ranks up, that Companion gains a scaling bonus to Presence (which increases Companion damage, healing, and health), as well as bonuses to crew skill time efficiency and critical rate. For example: when converted into Influence, 10,000 Affection (the cap for the old system) is exactly enough Influence to hit Rank 10, which equates to +500 Presence, +15% Crew Skill Time Efficiency Bonus, and a +5% Crew Skill Critical bonus. Sadly, the Companions of low level characters with massive Presence bonuses from their legacies will no longer be hilariously overpowered (I promise we're just as sad to see this go as you are, it provided some good times). Presence will scale much better at higher levels. With the launch of Game Update 4.0, all Companion-specific bonuses to Crew Skill performance will be removed. These bonuses were somewhat nice in that they added some texture and variety to Companions, but ultimately they were very problematic and restricting for players. In many situations they created a single Companion who was and would always be "the correct choice" for any given type of job. This meant that the optimal play was to simply pile one Companion with all the jobs, leaving your others idle. This became doubly problematic when your "correct" crafting choice also happened to be the Companion you most wanted to have with you on your galactic adventures. The removal of these bonuses allows endgame players to work towards having a stable of maxed Companion characters that can tackle all the tough work optimally and in parallel. No system overhaul would be complete without a slick new User Interface (UI), and to that end I present to you the Companions & Contacts UI, which by default is bound to the 'N' key (supplanting the Crew Skills window, which has been bumped over to 'B'). NOTE: This image displays the full roster of Sith Warrior class story Companion characters. Down the left-hand side of the window, is a quick and easy-to-browse list of your available followers (i.e. Companions), with at-a-glance indicators for the Companion's current role, their Influence rank and progress toward the next rank, and a button to summon them. Clicking on an entry in the list also brings up more detailed information about the character. We'll be doing even more with this UI post-4.0, so keep an eye out for more news on that down the road. Note: We're going to try /really hard/ to talk about things as generally as possible and avoid story spoilers as much as possible. We will spoiler tag screenshots, which will unavoidably contain this kind of information. Opposing the might of the Eternal Empire is not something that one can do alone. One of your major underlying goals throughout the Knights of the Fallen Empire story epic will be to build an Alliance capable of loosening (and maybe even breaking!) the Eternal Empire's grip over the galaxy. Recruit Companions From Other Classes: As you seek to build your Alliance, you will meet a host of characters, both new faces and old friends, including many of the origin class story Companion characters. In most cases, these Companions can potentially be recruited by members of any class, though some Companions may be less willing than others to so readily overlook old grudges. Choices that Matter: Just as in the Knights of the Fallen Empire Chapters (and in some cases moreso), your decisions within Alliance content can have a considerable impact upon story outcomes. As a result of your actions, Companions may be rejected, rendered unavailable, or even killed. The New Star Fortress Flashpoint: Make contact with local resistance cells on six of the core worlds, aiding their local efforts to rid their worlds of the Eternal Empire's Orbital Star Fortresses. Assault the Star Fortresses over each world once you've established local support! The Build an Alliance experience refers to a network of game content and story Missions that complement the storyline of the new expansion. 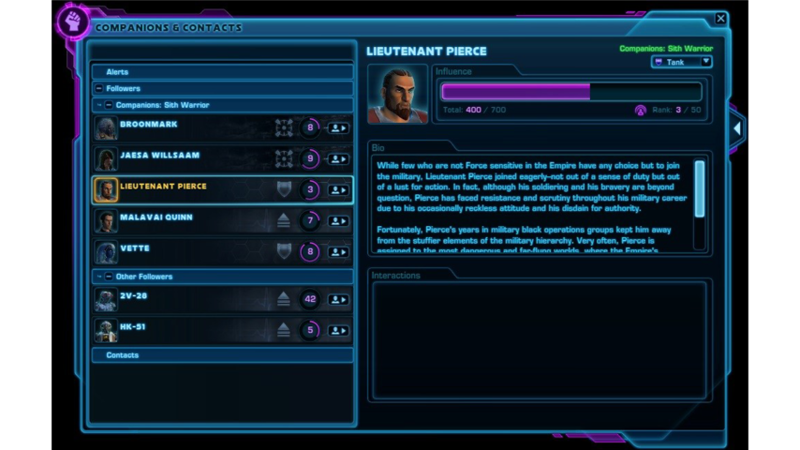 It is within the Alliance story Missions that you develop your Alliance by building its power, and by recruiting additional galactic forces or noteworthy individuals to your cause. New Alliance storyline will be released regularly alongside the new expansion story chapters. Alliance content begins in earnest as part of Knights of the Fallen Empire expansion. In the new expansion you are formally introduced to your Alliance, and the four major "Alliance Specialist" leaders who oversee the various aspects of each operation. In addition to the ways in which you can strengthen your Alliance on your own, your Alliance leaders will also occasionally send you special "Alliance Alert" Missions, notifying you of important events requiring your attention (generally revolving around new potential recruits for your Alliance!). Much of the Alliance storyline will focus on the origin class story Companions, and what they've been doing in the galaxy over the past 5 years. From there we plan to build upon this stable of established characters to expand the Alliance story network as the Knights of the Fallen Empire epic story continues to unfold. Alliance stories will generally be more intimate and character driven, designed to complement and counterbalance the more ‘epic’ storyline of the Chapter stories. They'll be very much about getting to know awesome characters, and controlling how your interactions unfold. Particularly noteworthy NPCs that you encounter over the course of your story will be tracked in the "Companions & Contacts" window under the "Contacts" header. Each contact's entry will present a short bio, as well as a summary of important prior interactions you've had with that contact. In addition, you will have an Influence rank with each of your contacts. Helping contacts in various ways will build Influence with those contacts, which may in turn unlock additional rewards or story options. Many contacts can be recruited into your Alliance, and some can even be unlocked as Followers. Followers are Alliance contacts that you can summon to fight alongside you on your adventures (just like Companions). You can also conveniently quick travel to any of the contacts you've established using their "Travel to Contact" button (provided that they are not otherwise unavailable for story reasons, such as you having shot them in the face). Contacts will occasionally proactively notify you of special Mission opportunities by sending you an Alliance alert. These appear under the "Alerts" header of your Companions & Contacts window. Clicking on an alert entry will bring up details about the alert, and allow you to embark upon the alert Mission. When you elect to start an Alliance alert Mission, in addition to being placed on the Mission, you will be automatically transported to the starting location for that Mission. These conversations use a distinct letterboxing format, as well as a distinct font styling to set them apart visually. These conversations are characterized by their more character-centric nature, both in terms of storyline and cinematography. Story character narrative lines in classic conversations are fully voiced as you have all come to expect. Player responses in classic conversations are presented as an open-ended list of response options, displayed in full (as opposed to in paraphrases), and are not voiced. The classic conversation format allows us to give you a much wider array of choices and potential outcomes, as well as more specific, complex, and subtle character reactions to your choices. One of the major Alliance Mission arcs present at launch in the Knights of the Fallen Empire expansion is centered on the new "Star Fortress" Flashpoint. In this series of combat Missions you will make contact with resistance leaders across six of the origin game worlds (Alderaan, Belsavis, Hoth, Nar Shaddaa, Tatooine, and Voss), helping them to fight back against the Eternal Empire, culminating in a final assault against the Orbital Star Fortresses installations in orbit above their worlds. The Star Fortress Flashpoint itself is unique in the way it uses a variable approach to gameplay, producing a large amount of variation between different runs of the Flashpoint. These layouts also include randomized bonus objectives and mini-bosses, which reward players with Influence as well as Achievements. You might also get some rare loot too! The Star Fortress comes in two difficulty modes, Solo and Heroic. The Solo difficulty mode for every planet's Star Fortress is available when players complete Knights of the Fallen Empire Chapter IX, as soon as they pick up the “Battle for the Stars” Mission. This mode is intended for a solo player and their Companion. The Heroic difficulty mode for a given planet's Star Fortress is unlocked by completing the planetary resistance Mission arc for that planet. This mode is intended for groups of 2 players (with their respective Companions). That being said, it is possible for a solo player to complete Heroic mode, provided that player has a high-rank Companion, and has built Influence with their Alliance specialists (as this unlocks access to various usable objects within the Heroic mode that provide powerful buffs and additional abilities). So there you have it: Companion system overhaul, cool character stories, and an awesome new Flashpoint. It’s all part of this thing we call Knights of the Fallen Empire, and we’re really excited to be able to share it with you all. We look forward to seeing you in the game and May the Force be with you!